Hardworking, friendly, dependable and ready to serve … these qualities define the many faces that make up the award-winning Rutter’s team. Behind those faces are friends, neighbors and members of York County’s communities who are doing more than just making it in a job. They’re making a career with a convenience industry leader offering high quality food and beverages, competitive fuel prices and the latest technology to enhance the customer experience. Rutter’s is committed to making an investment in its most important resource: its talented Team Members. 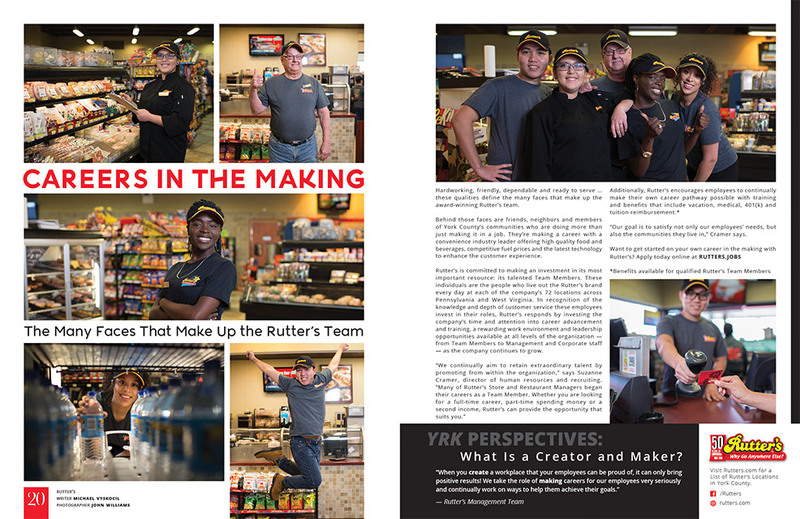 These individuals are the people who live out the Rutter’s brand every day at each of the company’s 72 locations across Pennsylvania and West Virginia. In recognition of the knowledge and depth of customer service these employees invest in their roles, Rutter’s responds by investing the company’s time and attention into career advancement and training, a rewarding work environment and leadership opportunities available at all levels of the organization — from Team Members to Management and Corporate staff — as the company continues to grow. “Our goal is to satisfy not only our employees’ needs, but also the communities they live in,” Cramer says.